Being really impressed with the shape and design of the 2011 Sakura mug I was a bit disappointed to see that 2012’s Sakura mug returned to the super small, thin design of the 2010 Sakura mug. The design is nice with some great colours and I’m surprised that they can create so many different designs of the same flower/tree (i.e. sakura / cherry blossom). It’s a nice addition to my collection though honestly won’t be getting much use due to it’s volume (about half that of a regular mug). It’s worth noting that the Sakura mugs were only for sale for about a week this year which is MUCH shorter than usual. The reason? Starbucks Japan finally decided to update their Starbucks Tokyo City Mug with a new and much fresher design! Check back soon for my post on the new Tokyo Starbucks Mug! One of my best friends sent this to me all the way to Japan while she was living in London. Normally I don’t like mugs as gifts as I like to get them as a souvenir of my own personal travels but the fact that this mug was year exclusive and I would never get the chance to buy it myself, I really loved getting this as a Christmas gift! The mug is a bit larger than the regular Starbucks mug and I really dig the glossy red interior which makes it cocoa and coffee stain proof. 🙂 Having never been to London I love how they made the mug city specific as well as being Christmas themed with the double decker bus and the London Bridge in the background. The heavy snow is really great and the metallic golden paint really makes the snowflakes and other features pop. 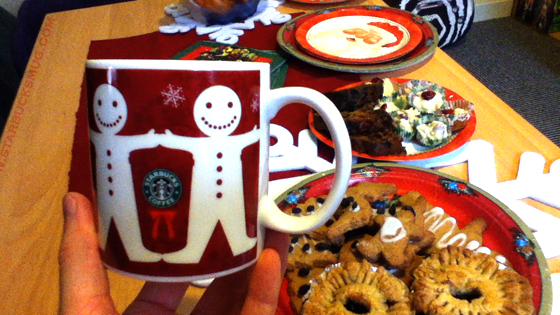 This is easily one of my favourite Christmas mugs. Do any other countries make city specific Christmas mugs? This, I think, was my very first Starbucks mug. I bought it in my first year in Japan while working in Shin Koshigaya in Saitama in 2004. I think I probably got it due to the fact that it had gingerbread men on it. I’m an absolute gingerbread nut at Christmas time and have been making them every year for the past 20 years or so. 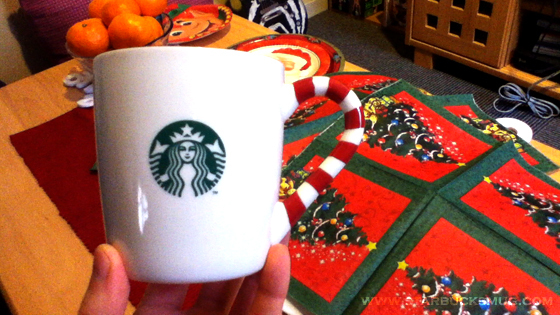 It’s a bit smaller than the regular Starbucks mugs, possibly aimed at kids. I seem to remember Starbucks marketing towards kids around that time with children’s beverages and other smaller merchandise so that would seem about right. Honestly haven’t used it to drink out of but used it this year to hold pretzel sticks on the table while having friends over. I really like the design with the repeated gingerbread men cookies and the white and red colour scheme. What do you think?